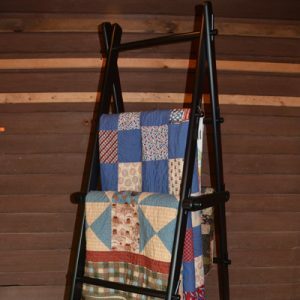 Quilt Display hardware is stainless steel and brass and will not rust or damage the quilt or textile art. The hardware does not come in contact with the quilt. The quilt binding is positioned in the clamping board groove provided below the hardware. 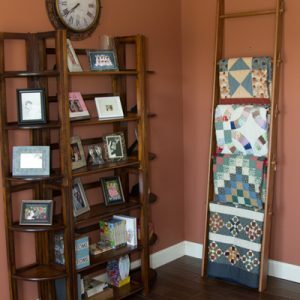 The Quilt Display can be ordered with or without the shelf. 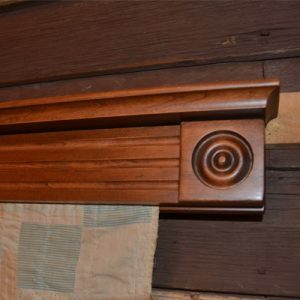 The shelf is 3 1/2″ or 5″ deep and has a plate groove 1 3/4″ from the back of the shelf. Only premium finishing materials are used for quilt and textile safety. 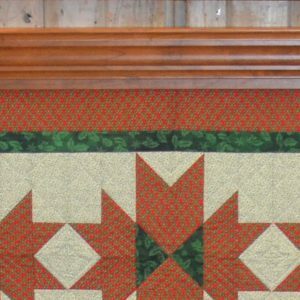 Quilt Displays are available in Pine, Poplar, Oak, Maple, Cherry, Mahogany and Black Walnut. Quilts of various widths can be mounted from one quilt display. The Quilt Display will accept quilts, and other textile art up to 5/8″ thick. Thicker quilts can be accommodated by using longer stainless steel threaded knobs. Quilt Displays are precision sanded to ensure that even pressure is applied to the clamping surface. Irregular quilt borders such as scallops can be easily displayed. Installation is easy with molly bolts or wood screws and included hangers. A variety of solid colors are available at an additional charge.